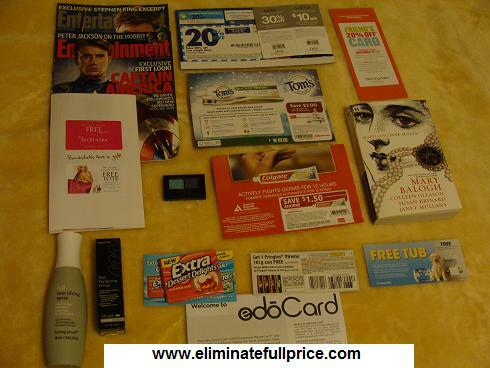 Eliminate Full Price: Mailbox Monday - Cool coupons! My favorite freebie I received this week was the Bespelling Jane Austen Book I won from HQNBooks' #HQNhalloween giveaway on Twitter (@HQNBooks). I can't wait to read it. -NYC eyeshadow I won from being one of the 1st 500 people to enter Allure Magazine's August 2010 giveaways. -Murad primer I won from being one of the 1st 50 people to enter Allure Magazine's August 2010 giveaways. -Living Proof: Full Root Lifting Spray I won from being one of the 1st 500 people to enter Allure Magazine's August 2010 giveaways. Really nice mailbox!!!! I got the Key Lime Pie dessert gum...it was so good! It didn't make it to my mialbox picture. I also got the Vickyy Secret coupon (woohoo!). You are SOOOO lucky with being the first to respond to the Allure offers! Happy MM!